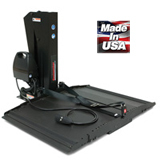 Now you can easily take your mobility device on the road in your sport utility vehicle with the Backpacker® AVP from Pride® Lifts and Ramps. 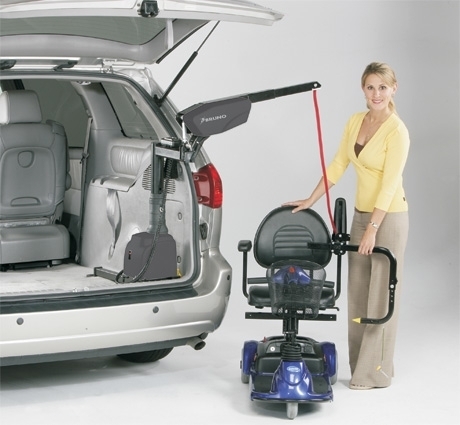 It's the ultimate solution to lifting your powered mobility device into your vehicle, engineered specifically to be a perfect fit for a wide variety of popular vehicles including SUV's. Like all Pride Lifts, the Backpacker AVP features all-steel construction and a protective finish, along with an industrial rated 12 volt motor and battery pack, and easy-to-use controls to combine rugged durability with safe, simple and reliable operation. Adjustable platform for smaller SUV's 42"-34"